When I saw this graphic, posted on an atheist website, my immediate reaction was: I bet that’s how the world looks to a lot of people. It’s hardly a stretch to write that planet Earth appears to be in permanent chaos. Wars, Ebola virus, fundamentalist terrorism, rampant corruption, female and child slavery, broken marriages, child sexual abuse. I’m sure you can easily add to the list. So where’s the plan? Is all this playing out according to some orderly arrangement? Really? In a word, YES. Now stay with me while I explain. 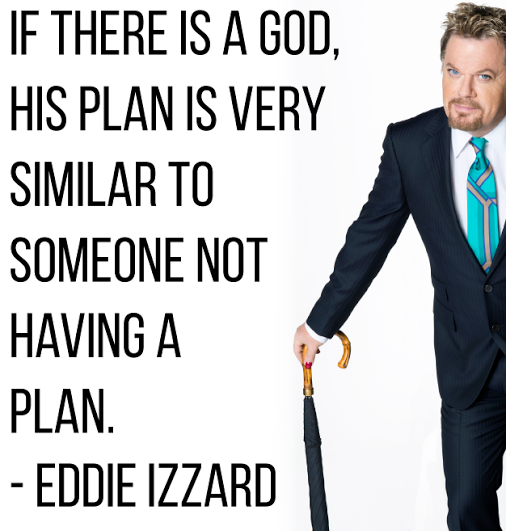 Serious Christians like me believe God’s plan is not so much about events. It’s about people. It’s about a relationship with Him through Jesus Christ, whom serious Christians believe is God’s divine Son. Christians have started hospitals and universities (this essay sheds light on that topic: http://wp.me/p2wzRb-9O). A Christian, William Wilberforce, tirelessly led the decades-long fight to end slavery in Great Britain. Christian scientist Francis S. Collins played a leading role in mapping the human genome. Members of a Christian organization, the International Justice Mission, risk their lives to free female and child slaves in the developing world. Second World War hero Louis Zamperini (subject of the Hollywood movie Unbroken) was an angry alcoholic tortured by regular nightmares of his time in a Japanese prison camp. Then he became a serious follower of Jesus Christ. The nightmares ended. The drinking stopped. And his troubled marriage was restored. Beaten up and betrayed by his criminal friends, Michael “Bull” Roberts was at the end of his rope when he reached out to Jesus Christ. Since then, he’s left behind a life of crime and sought to help others in his situation. (You can read a bit more of his story here: http://wp.me/p2wzRb-5g). 3. It’s based on free will. This might seem difficult for you to accept because free will includes our ability to do all the nasty stuff I mentioned in the second paragraph. You might protest that a loving God would not allow all those things to happen. But centuries of evidence shows that free will is an all-or-nothing proposition. If the nasty things I mentioned were stopped, then so would your ability to ignore God and reject the gift He offers you: a changed life, now and for all eternity, through faith in Jesus Christ. It’s up to YOU to respond to the gift. It’s up to YOU to figure out whether you want to be part of God’s work to make this broken world a better place. It’s up to YOU to take hold of the life-changing peace He offers through Jesus. So what do you think? Post your thoughts below and let’s have a conversation.